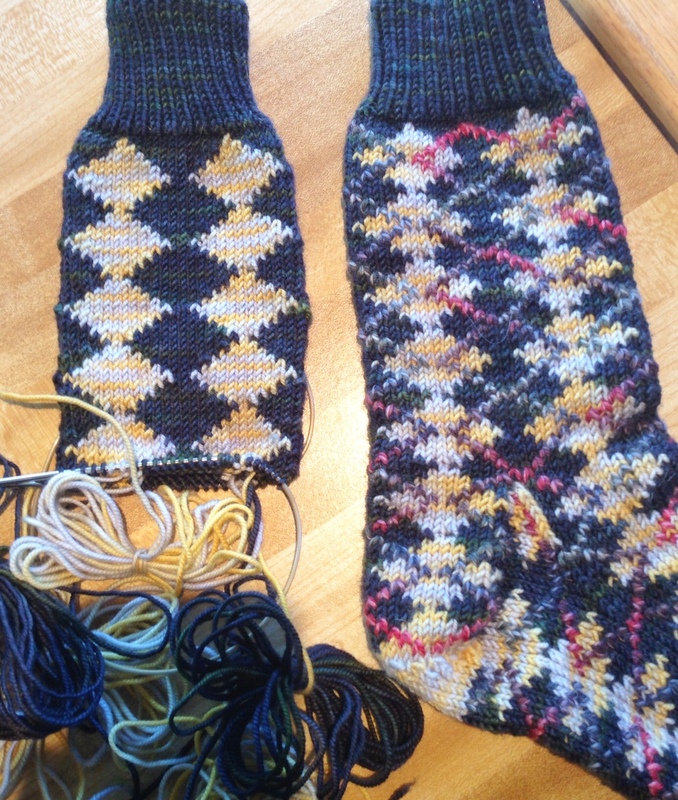 Home » Annetarsia Knits » The Ultimate Argyle Sock! I’ve been going back through projects that I worked on while developing Annetarsia. A few didn’t make it into the book, for various reasons, and were abandoned. Now I’m bringing them into the light and thinking about offering them as patterns. 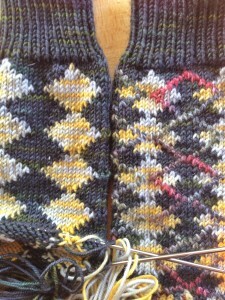 Which, of course, means I have to finish them and do the work of writing the patterns up. Not as much fun as knitting, but it must be done. A few years ago, I was challenged (by Tina Newton, who has the best ideas….) 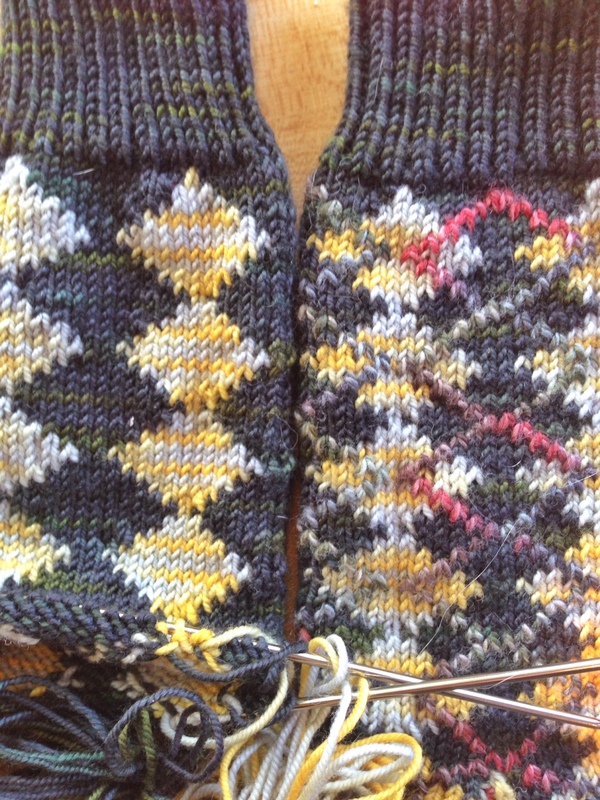 to see how much of a sock I could cover with argyle patterning, now that it is possible to work ITR. This sock was the result. 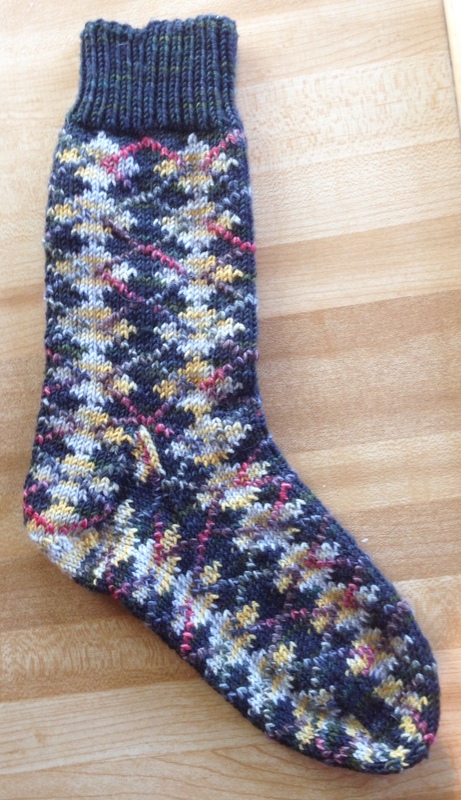 I actually knit another Ultimate Argyle sock in a different colorway and size, but I think I will save that one for another day. I love this sock, and think that ITR knitters might like it, too. So, I am knitting a mate for it, testing the pattern and charts that I wrote 2 years ago. Knitting a second sock years later isn’t nearly as annoying as doing them right after one another. In fact, the knitting of this sock is actually going too fast! 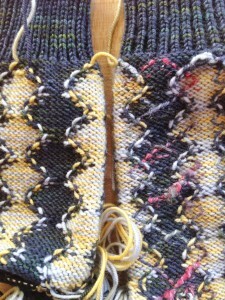 I just started, and I’m already at the heel! I left the pattern at home, so am taking a break from knitting to show you the work, so far. Knitting a mate for Ultimate Argyle sock. Sock Yarn is BMFA STR lightweight. Duplicate stitch yarn is BMFA Silkie. RS shown. Sock on the right has been blocked, and Accent lines added with duplicate stitch. Close up of the WS. Knitting on the right has been blocked, and had Accent lines duplicate stitched. The sock is knit with just the background and the diamonds, so it looks a lot different than the finished version. The accent lines really tie everything together. So, what do you think? Is the world ready for this?